Thomas, Earl of Lancaster and Leicester (c. 1278 – 22 March 1322) was an English nobleman. 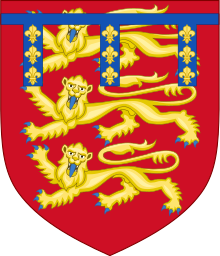 A member of the House of Plantagenet, he was one of the leaders of the baronial opposition to his first cousin, Edward II of England. His marriage to Alice de Lacy was not successful. They had no children together, while he fathered, illegitimately, with another woman, two sons. In 1317 Alice was abducted from her manor at Canford, Dorset by Richard de St Martin, a knight in the service of John de Warenne, 7th Earl of Surrey. This incident caused a feud between Lancaster and Surrey; Lancaster divorced his wife and seized two of Surrey's castles in retaliation. King Edward then intervened, and the two Earls came to an uneasy truce. Lancaster was one of the Lords Ordainers who demanded the banishment of Gaveston and the establishment of a baronial oligarchy. His private army helped separate the King and Gaveston, and Lancaster was one of the "judges" who convicted Gaveston and saw him executed in 1312. After the disaster at Bannockburn in 1314, Edward submitted to Lancaster, who in effect became ruler of England. He attempted to govern for the next four years, but was unable to keep order or prevent the Scots from raiding and retaking territory in the North. In 1318 his popularity with the barons declined and he was persuaded "to accept a diminished authority." Lancaster was tried by a tribunal consisting of, among others, the two Despensers, Edmund FitzAlan, 9th Earl of Arundel, and King Edward. Lancaster was not allowed to speak in his own defence, nor was he allowed to have anyone to speak for him. He was convicted of treason and sentenced to death. Because of their kinship and Lancaster's royal blood, the King commuted the sentence to mere beheading (as opposed to being drawn, quartered, and beheaded) and Lancaster was executed on 22 March 1322 near Pontefract Castle. Given-Wilson, Chris (1 June 1994). "Richard II, Edward II, and the Lancastrian Inheritance". The English Historical Review. 109 (432): 553–571. doi:10.1093/ehr/CIX.432.553. JSTOR 572908.